Turkey's Grafen reports first results from their graphene liquid-phased exfoliation research (conducted with help from Ukraine's National Academy of Sciences - BPCI). The new method uses direct liquid-phase exfoliation of graphite to create graphene sheets and it creates unique product crystallinity and lower environmental footprint. 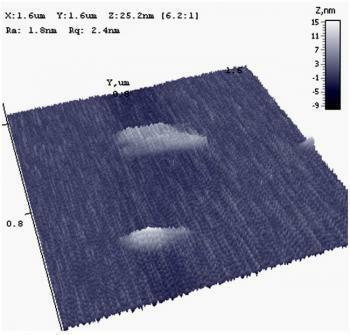 Grafen reports that initial atomic force microscopy (AFM) data shows multilayered graphene sheets, 10-15 nm in thickness and about 0.5 um in diameter proving great potential of the process. Hopefully we'll hear more from Grafen about this new process and more results soon.